Use leaves from your backyard and your own hand to make this festive Thanksgiving craft. Trace your child’s hand onto a sheet of paper. Draw an eye and a beak where the thumb is. Draw legs where the heel of the hand is. 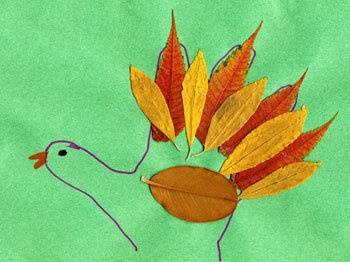 Give the turkey a colorful tail by gluing long, thin leaves to where the fingers are. Glue on a short, round leaf to the middle of the hand for the turkey’s wing. Let the glue dry before you hang it up or share it with a friend.